So you’ve decided to use metal panels for your building project, and now it’s time to get specific. One of the first decisions you’ll make is what gauge, or thickness, you need. 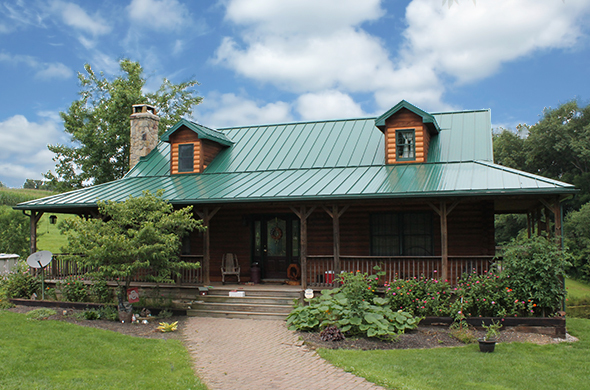 There are many metal roof and wall panel profiles to choose from, and they are all available in several gauge thicknesses … but what does that really mean? U.S. manufacturers express metal panel thickness as gauge, with 22-gauge being the thickest and 29-gauge the thinnest of the traditionally-sold metal roof and wall panels. Each gauge represents a nominal decimal range. For example, a 26-gauge steel panel can range between 0.0179 and 0.0217 inches thick according to a finding from the University of North Carolina at Chapel Hill. This means that while a 26-gauge panel from one manufacturer could measure 0.027 in. thick, a 26-gauge panel from another manufacturer could measure only 0.0179 in., but both are sold as 26-gauge panels. Although those seem like small numbers, they represent a noticeable difference in panel stiffness and strength. So how do you know if the manufacturer of your metal panels has used thinner sheeting and made up the difference with a thick coat of paint? A smart shopper will look beyond the gauge number to the manufacturer’s specifications on metal thickness to ensure they’re getting the gauge they’re paying for, and the one that most appropriately suits their needs. Are Thicker Panels Worth the Cost? Expect to pay more for thicker panels. The cost of a 26-gauge product will be about 15 percent higher than a 29-gauge with the same profile from the same manufacturer. While some people insist that the extra cost is always worth it, that may be misleading. Yes, thicker panels are stronger, but the importance of that added strength depends on the type of building construction as well as your priorities and location. There are instances where thicker gauges always earn their keep. The most common of these is the post-frame building, or pole barn: an open-framed structure used for barns, garages and warehouses. Post-frames generally lack structural sheathing, so the roof and wall panels must span between the supporting trusses or purlins. Because 22-, 24- or 26-gauge sheeting is thicker, and will therefore remain more structurally sound over a longer span than a 29-gauge, the building needs fewer supports, which saves money. For post-frame structures like this, it is important to consider the potential snow load your roof may need to support when choosing your metal panel gauge. Lighter-gauge (thicker) panels may save you from structural collapse in the winter months! Lighter gauge (thicker) metal is also more forgiving of installation errors such as the over-tightening of screws, and it won’t be as likely to transfer bumps and waves in the sheathing. (The latter is more likely when re-paneling an older home.) Thicker trim pieces will also lay more accurately, so some homeowners and contractors opt for 29-gauge roof and wall panels with 26-gauge trim, a combination that is common and cost-effective. When is a thinner panel the smarter option? Span isn’t always a concern in the residential market. Nearly all homes have a layer of plywood or oriented strand board sheathing covered by a weather-resistant barrier. The metal panels are affixed to the sheathing and serve no structural role in these instances; their job is to keep the sheathing dry. 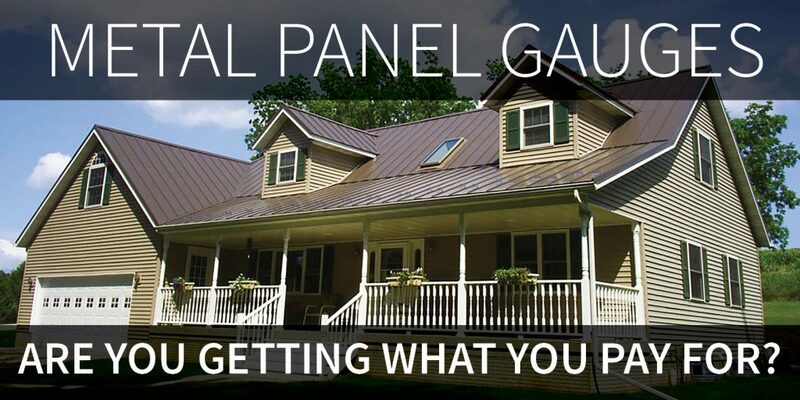 A quality 29-gauge panel is more than adequate for this—which is why it’s used on nearly 80 percent of homes with metal panels. Despite this, thicker (lighter-gauge) panels can make sense for buildings in hail-prone areas, but not because of structural integrity. A 29-gauge metal panel can have the same impact-resistance rating from Underwriters’ Laboratory (UL) as a 26-gauge panel; the advantage of thicker metal panels in this case is that they are less prone to denting. If you live in a place like Cheyenne, Wyoming (the hail capital of North America) and are concerned about long-term appearance, thicker panels may be the better option for you. For more information on which panel is right for your next metal building project, check out our panel selection chart and contact your local ABC representative today. Metal Product Distributors: quote and order metal building products anytime, anywhere and from any device using our online ordering tool. If you don’t already have an account, register for access today!